For those who haven’t followed it CIEDRA is “Central Idaho Economic Development and Recreation Act,” which some call the “Wilderness Bill” for the White Cloud Mountains, but it involves a lot more. It is sponsored by Idaho Republican US Representative Mike Simpson who crafted a bill that barely convinced diverse interests to support what might be the first Wilderness Bill in Idaho in 26 years! 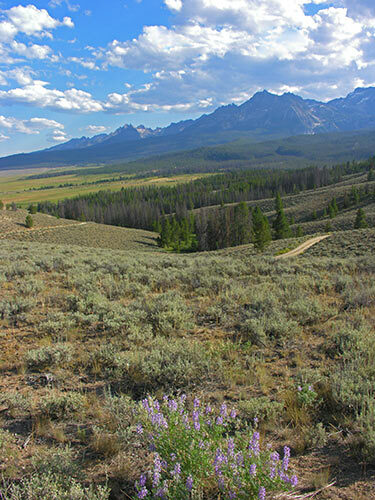 However, the bill has many detractors, both on the Wilderness side and anti-Wilderness side. One of the keys for getting support from the anti-Wilderness Custer County Commissions was privatization of public land, and one of places where it would be privatized is on the hill behind Stanley, Idaho. I have supported CIEDRA, though with little enthusiasm. I have warned Idaho conservationists that the Senate could be real danger (the bill passed the House this summer). The bill is now in the hands of Idaho US Senator Larry Craig, who has always been a die-hard supporter of the traditional extractive uses of the public lands, and not a supporter of “consensus processes” like Rep. Simpson used. It looks like Craig is up to his old tricks, and the folks in Stanley who don’t share the views of their Custer County Commissioners are worried about what he is up-to. There are a lot of earlier stories about CIEDRA and other wilderness/roadless news on my old web page. Update on Sept. 18. I heard they had quite a meeting in Stanley on Sunday. I hope the Idaho Mountain Express and the Challis Messenger got the good parts, and the gist of what was going on. The Express publishes on Wednesday and the Messenger on Thursday. I am not surprised by the increased drama ov CIEDRA as we near Craig’s hearing in the Senate. I’ve been following the progress of this bill and can find reason to be both optimistic and pessimistic about its chances with its fate resting in Senator Craig’s hands. It would be a shame if this got derailed at this point given all the hard work that has been put in so far, though I suppose there has been equally as much hard work put in by many people and organizations to derail it, so that always depends on your perspective. There’s a lot to be worried about between now and January. If the Democrats win control of Congress, those Republicans who hate public lands will try to push through a lot of horrors in their “lame duck” session after the election. The same might be true if they keep their majority. Officially, there is not going to be a lame duck session, but their progress on the budget is so slow, we know there will be one.